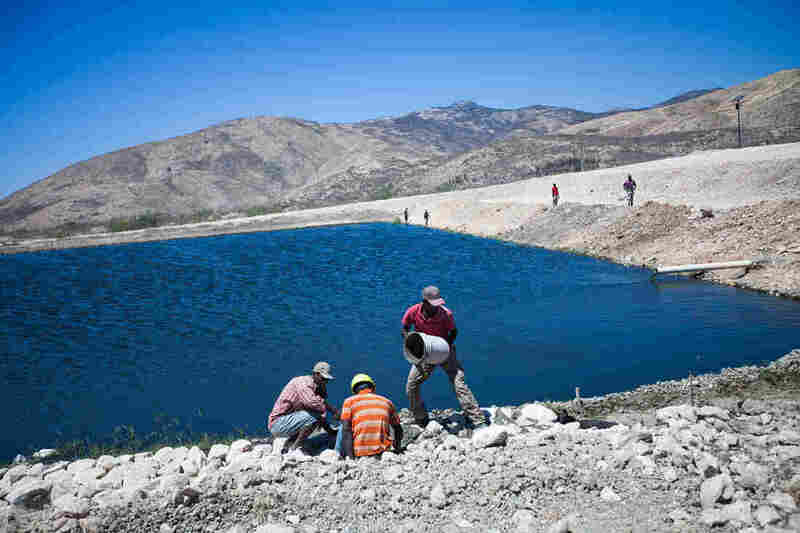 Haiti: Millions Spent On Sewage Systems And Still Nowhere To Go : Goats and Soda What went wrong with Haiti's sanitation plan? The story involves the queen of Spain, the "sanitation champion" and the man with the worst job in the world. 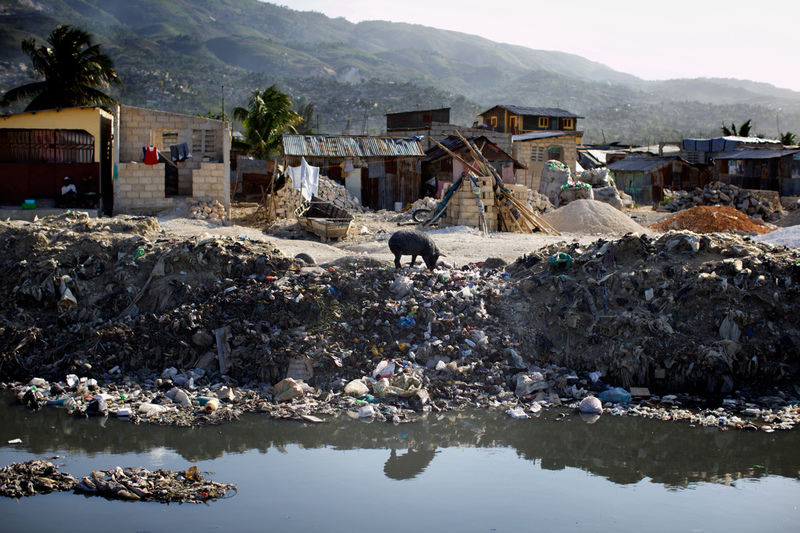 People dump trash and raw sewage into canals that run through Port-au-Prince, Haiti. When it rains, the canals overflow and flood poor neighborhoods. The rain began on Good Friday. It fell into the roofless ruins of Port-au-Prince's Catholic cathedral. It swirled through stalls in the market downtown. 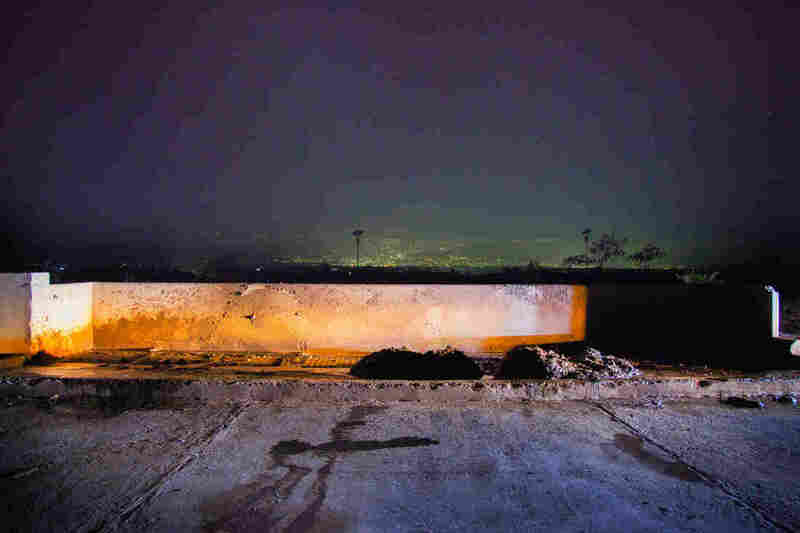 In the hills above Haiti's capital, the rain ran off the clay roof tiles of upscale homes. At the edge of the city next to the shore, the rain pounded on the zinc roof of Jean Claude Derlia's single-story cinder block home. His neighborhood, Project Drouillard, is dense with families packed into homes like his. Most people who grew up in Project Drouillard have stayed, as he has. The community is close-knit, poor and socially isolated from downtown Port-au-Prince. Now, over the sound of the rain, Derlia heard people shouting, "The water is coming!" There was nothing he could do but wait and pray that the water, or the things the water carried with it, wouldn't kill him this time. 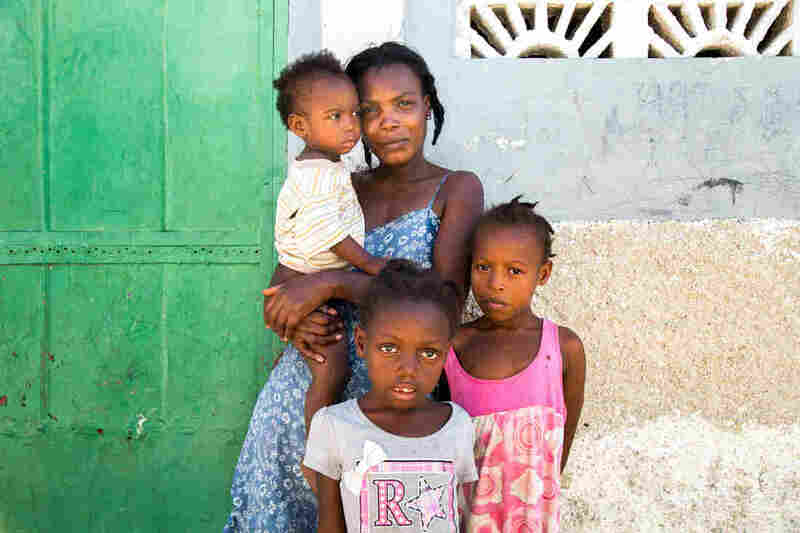 It's a problem that has attracted international donors, some of whom have acted to do what the Haitian government cannot afford to: build a sewage treatment system. Since 2010, international groups have spent millions of dollars on a plan to build open-air sewage treatment plants across Haiti. In 2012, the first facility opened at a site called Morne a Cabrit, about an hour from downtown Port-au-Prince. At the time, a government official told NPR that funds were in place for facilities in seven other cities. But five years later, that construction plan has stalled. Morne a Cabrit is still the only operational sewage treatment plant in the country, another $2.1 million facility is all but abandoned and the volume of sewage being disposed of safely in Port-au-Prince is actually decreasing. At its core, the floundering sewage treatment strategy is about money and power. Haitian economist Kesner Pharel, who has advised both the Haitian government and international nongovernmental organizations on investment and development in the country, says the stalled plan reflects a fundamental flaw with how infrastructure projects are funded and implemented in Haiti. Because the Haitian government is so dependent on outside money for infrastructure, "it is very easy for [international donors] to come in and say, 'I'm going to do this, I'm going to do that,' " he explains. The result is that the country's leaders become more responsive to funders than to Haitian voters. "Where is the accountability?" he says, "not to international donors, but to your people?" In the past five years, the story of one failed sewage treatment plant project offers the clearest example of the good intentions, poor governance and bad luck that contributed to Haiti's current sanitation crisis. It began with a young woman and a huge earthquake. Edwige Petit has been called Haiti's "sanitation champion." 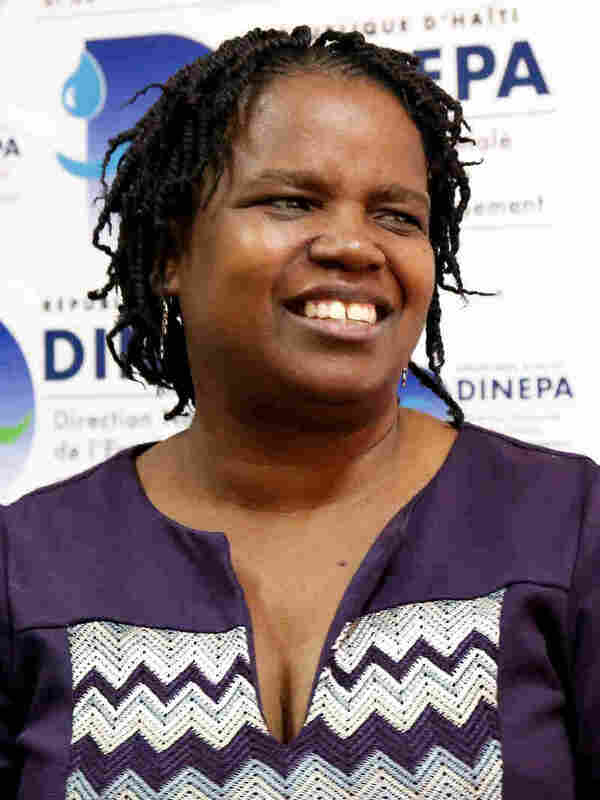 Trained as a civil engineer, Petit, the current director of sanitation at the Haitian water and sanitation agency DINEPA, has also been called less laudatory names because of her expertise. "Sewage wife, trash wife, lots of names," she says, laughing. Her first experience with sewage treatment came a few months after the 2010 earthquake that destroyed much of Port-au-Prince. Aid groups provided clean water and toilets to hundreds of thousands of people in displaced-person camps. The groups needed somewhere to dump the more than 10,000 gallons of human waste the camps generated each day. 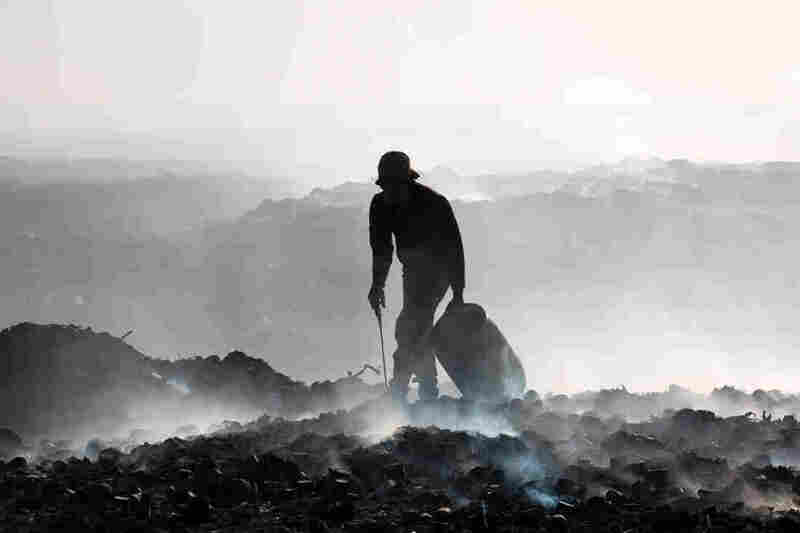 Initially, the government directed them to an unlined pit at the edge of the landfill. Petit was an expert on the landfill and immediately knew dumping there was not a good solution. The pit was unlined and right next to the sea, so the sewage could easily contaminate fishing areas and sources of drinking water. But for months after the quake, with the economy in shambles and the city in ruins, large-scale sanitation projects were never a political priority. "People don't have enough money. What can you say when people cannot even eat? You're talking about waste?" she says, channeling her detractors. "They cannot eat, they cannot s***! So that's the deal. Too much poverty." 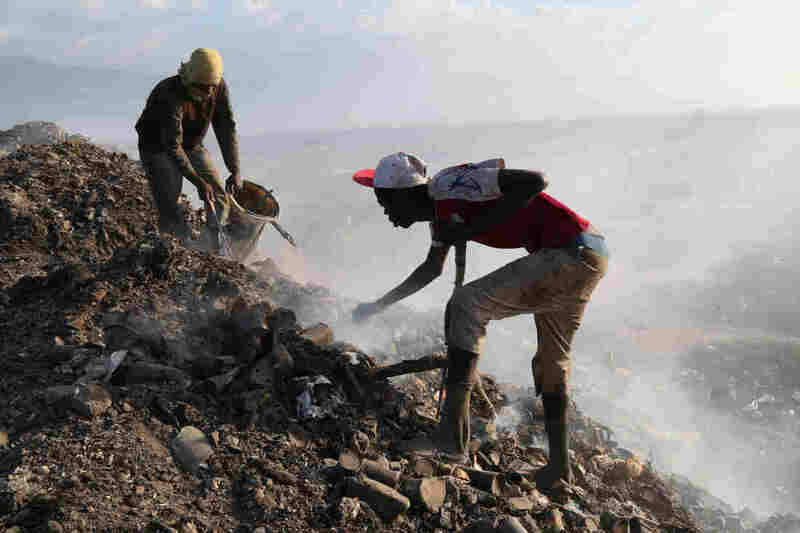 After the 2010 earthquake, NGOs dumped hundreds of thousands of gallons of raw sewage at the end of the Port-au-Prince city landfill, which borders the sea and is not lined with an impermeable material. Then that fall, U.N. soldiers from Nepal brought cholera to Haiti. "Only the cholera could make us have [the first sewage treatment facility]," Petit says. "Only cholera. Because we were afraid, totally afraid of cholera. For this reason, everyone agreed." In October 2010, the government of then-President Rene Preval announced it had found a location for the country's first sewage treatment plant, on land formerly leased by the Haitian American Sugar Company and left empty for years. The site was named for the nearby area of Titanyen, where thousands of people had been buried in mass graves after the earthquake. The initial budget inscribed on a now-faded sign at the entrance was $1.9 million — it would later grow to $2.1 million — to be paid by the Spanish government, which would also fund a public education campaign about cholera prevention. Construction began immediately, but just three months later, it stopped. Powerful people had leveraged their connections to the president, alleging that they owned the land under the sewage plant and demanding compensation under eminent domain before construction could go forward. "For each [piece of] land, we had not one, but two or three people who said they were owners!" Petit remembers, still fuming more than six years later. "They went directly to president." For nine months, nothing was built at the Titanyen sewage treatment plant. In that time, disease surveillance data suggests more than 2,500 people died of cholera in Haiti. Without a safe dumping site open, DINEPA data suggests more than 100,000 cubic meters of raw sewage was dumped elsewhere in and around the city. In the end, the Haitian government had little choice but to pay the alleged landowners, since the rest of the Spanish funds were unavailable as long as construction was stalled. In the meantime, funding the plant appeared to be a point of pride for the Spanish government. Queen Sofia of Spain even traveled to see it. 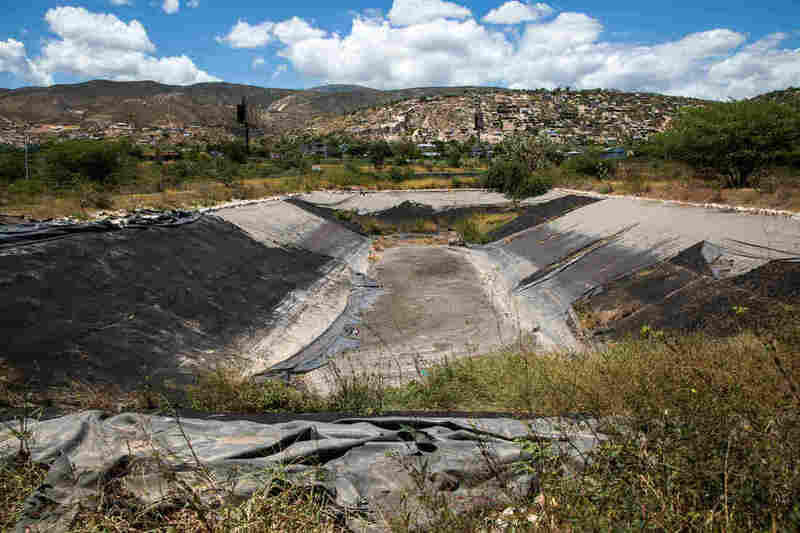 When the sewage treatment plant finally opened in May 2012, after the cholera epidemic had peaked, a press release from the Spanish aid agency AECID said nothing about the construction delay. It pointed to the project as an example of "strengthening of Haitian institutions" and said it would "contribute significantly to the health of the population and halt outbreaks of diseases such as cholera." The facility operated for just 18 months before a technical problem — huge bubbles in the lining of the second waste treatment pool — forced it to close. Since then, it has remained closed. DINEPA says the aid agency plans to spend an additional $617,000 to repair it beginning this fall. A spokesperson for AECID declined to comment on its sewage treatment plant projects in Haiti, citing turnover in its staff in the region. Haiti's sewage champion, Petit, still believes that sewage treatment plants are a good investment for Haiti. She is using the agency's investment funds, 96 percent of which came from international sources last fiscal year, to build at least 30 waste treatment facilities across the country. Three, including the still-shuttered site at Titanyen, are under construction or repair. "The government has a duty to build the plants we should need," she says. "I can say I am doing my part." Meanwhile, the one sewage treatment plant that is already open is below capacity and struggling to cover its operating costs. International money covered its construction, but domestic funding and customer fees are insufficient to cover long-term maintenance and payroll. Inadvertently or otherwise, the availability of international money for infrastructure appears to have motivated the construction of sewage treatment plants in Haiti, whether or not there is local demand for the facilities. Residents blamed the flood on poorly excavated canals and on the waste dumped by rich people who live on higher ground. Both are undoubtedly true, but the waste clogging the canal also came from right there in Project Drouillard. Scattered throughout the neighborhood are sets of cinder block pit latrines, most of which are filled to the top with waste. "We can't use these," says 27-year-old Bernard Paulemon, gesturing to a set of six stalls near the headquarters of his neighborhood group, Foundation Alovie. "The people here, they can't pay." He is referring to the cost of maintenance. When a latrine fills up, residents see two options: They can padlock it and leave it, at which point some people resort to relieving themselves in an open field near the canal, or they can pool money to hire someone to clean out the pit. Magdala Simeone lives a few houses away from a block of six pit latrines, each with a padlock on the door. Four of the six stalls are too full to use. Kids come and go with the keys for the other two. A few weeks ago, Simeone and her neighbors raised money to hire someone to clean one of them out. The total cost: $75. Her share: about $8. She never saw who cleaned out the latrine and doesn't know where they dumped the contents. A trip across the waste-strewn field adjacent to the canal holds a hint — the canal is completely filled with muddy excrement. She would prefer to have a company clean out the latrine. "The company will clean it better" than the informal latrine cleaners known as bayakou, she says, but "a private company will ask you for a lot of money." Sanitation companies in Port-au-Prince see the potential for big profits in neighborhoods like this one. "There are lots more people who could pay us, but they haven't heard of the company. They don't know what we do or why they should give us money," says Marguerite Jean Louis, the CEO of the Port-au-Prince-based sanitation company Sanco. She is banking her new company's future growth on educating middle- and low-income Haitians about the importance of paying for sewage pickup and disposal. This is the "market first" model of sanitation reform in Port-au-Prince. Simply put, it's the belief that the limited cash available for sanitation should be invested in increasing the demand for sewage removal rather than in large-scale infrastructure projects like sewage treatment plants. Flaure Dubois, the financial director at Jedco, the largest sanitation company in the country, says the government's focus on sewage treatment plants is frustrating because there is so much public education work to be done around sanitation. She sees her company as more aligned with aid groups doing sanitation campaigns than with DINEPA and its construction plans. "We need to change the culture," says Polyanna Domond, Jedco's marketing director, showing off a Jedco sign that explains in Creole how to use a portable toilet (Sit on it, don't hover above it!). "We are investing in public education, so people know that waste can make them sick. The government should ask us for help." Everyone in the neighborhood could smell it; a heavy, earthy stench, like rotten eggs and feces. In the back corner of a neat courtyard surrounded by single-story houses, four men were getting ready to empty out a pit latrine. 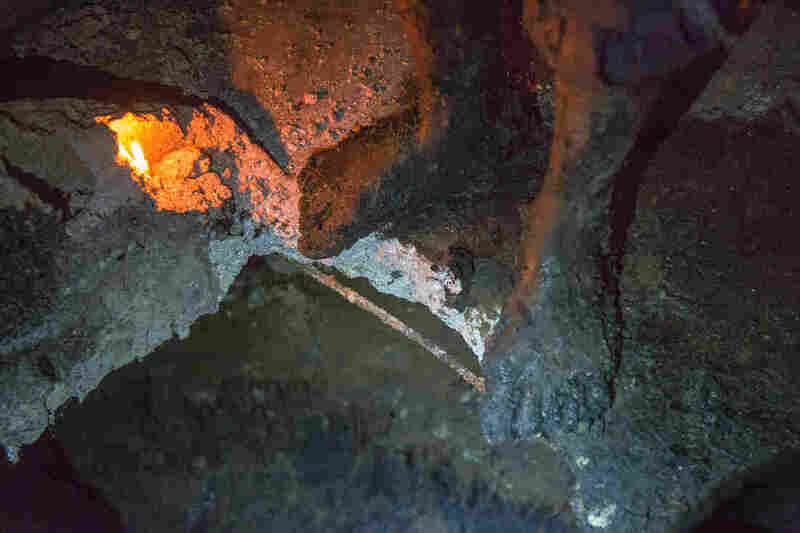 The leader, a 35-year-old who said his name was Gabriel Toto, was standing over a 15-foot pit filled with human excrement, his pants rolled up to his knees, shirtless with yellow rubber gloves and a cigarette dangling from his lips. He explained that Toto is a nickname he used when he discusses his job, to minimize the stigma and ostracization he and his family face because of his occupation. For the same reason, he and his men work only at night. "I am a working man," he said, just trying to make a living without getting caught up in the organized crime that dominates the economy in his neighborhood near Project Drouillard. "I don't want to do anything bad. So, whatever I need to do — whatever I have to do — I will do it. Anything." For the last decade, doing "anything" has meant working as a bayakou. The job is dangerous, disgusting and difficult. To watch Toto work is to see an expert perform his craft, moving confidently and carefully to remove about 400 gallons of human waste from an underground, candlelit hole in less than three hours, using only his gloved hands, a bucket and a rope. Even for a pro, the work is risky. "I have had stitches on my legs, my feet," Toto says. "I even lost one of my toenails one day when I was working." Another bayakou, Derisma Merisier, says an infection is responsible for his red and puss-filled eyes. He has been living with it for years. And the latrines are full of hidden dangers as well. People throw all sorts of things in the hole. Sticks, rocks, trash and razor blades are nightly hazards. On this night, an excrement-covered handgun shows up in one of the buckets. The owner of the outhouse paid Jedco about $170 for the cleaning service. As subcontractors, Toto and his men will each take home about $3.90 for the night's work. They make eight to ten times more working for themselves, but as the companies have moved into the market, many bayakou feel forced to work as contractors. Working for a company could theoretically offer perks. On this night, Jedco provides five pairs of coveralls (in plastic packaging), rubber gloves, boots, goggles and even blue Jedco baseball caps (new with the tags still on). The men laugh wryly when they see the protective gear. "They usually don't give us these things," says Toto. The clear implication was that the protective gear is related to the presence of journalists. Usually, the men work in little or no clothing. By the end of the night, the goggles are fogged up and useless, gloves are ripped and most of the men have discarded some or all of the gear. As it is, Toto says he doesn't make enough to support himself and his three children. After a night's work, he spends the day looking for hourly labor jobs, although a lot of people won't work with him or even touch him. "You've seen what I have done," he says, standing in the parking lot of the sewage treatment plant at 2:30 a.m., his hair still wet from a bucket bath. "Some people will never stand close to me, talking to me the way you are talking to me, as close as you are. They'll stay away from me because they see what I'm doing with my own hands." The Haitian government and private sanitation companies talk about public education campaigns and sanitation market development and infrastructure. But as the person who does the work of bringing human waste from the city to the dumping site, Toto feels ignored and abused. "The first people in the community who should give value to the work we're doing are the companies," he says. "When they sit behind a desk in the air conditioning, they don't care. If they don't give value to what we're doing, who else will give value to that?"